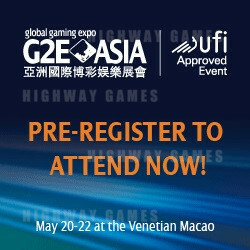 Global Gaming Expo Asia (G2E Asia) is the premier Asian gaming event and one-stop sourcing platform for decision makers in Asia to discover the most comprehensive array of gaming and entertainment-related new products and services, network with industry-leading manufacturers, and learn the latest trends. Held in Macau - the heart of Asian gaming and one of the fastest growing gaming markets in the world - it’s the best resource to gain a competitive edge for your business and your career. Global Gaming Expo Asia (G2E Asia) is the international gaming exhibition and conference dedicated to the Asian gaming market. Organized by the American Gaming Association (AGA) and Reed Exhibitions, G2E Asia made its debut in June 2007, defining itself as the leading event for the gaming entertainment industry in Asia. (G2E Asia is part of The Global Gaming Expo (G2E) portfolio of events. G2E is the largest event for the global gaming industry and is held annually in Las Vegas, Nevada USA). G2E Asia consistently delivers quality exhibitors and unique networking opportunities for visitors from across the Eastern hemisphere and beyond. If you are engaging in the following businesses or sectors, don't miss this year's G2E Asia held in the heartland of the Asian gaming industry—Macau! Who should exhibit at G2E Asia? Visitor Registration is not open yet. G2E Asia Show Interview with IGT Coming Soon!